Something I must have had miss in the last couple of years. Proteopedia for instance. Compared to my approaches to control time-related media Proteopedia uses similar concepts from the beginning. To distinguish from usual controls, e.g. 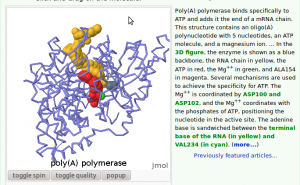 hyperlinks referring to other contents, they introduces green links to change orientation the proteins represented as 3D models.